I've always been crafting, ever since I remember. When I was small I loved making my own bracelets, playing with clay, cutting things out, drawing…. I could spend hours on my own "creating" new things. One day by chance while searching through the net. I thought it was a wonderful idea and I am very pleased to be able to show all my items worldwide. As a hobby I have touched many different crafts and for some time I have been giving craft classes to young children. My shop is filled with colour. Most of the books that I bind are hand painted by me. Others are made of fabric. In my shop you can find journals, photo albums, portfolios, and more, all done by myself without any help. Well...I’m quite a newbie myself. Joining an Etsy team helps a lot and I would say that most important of all – enjoy what you are doing. I wish I had more space in my workshop – I never find anything!! In a couple of shops. Well. 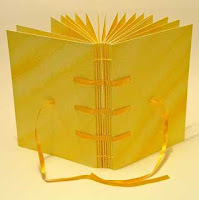 It happened a few years ago when I joined a bookbinding course. Since then I haven’t stopped making books!! Crafting – For as long as I can remember. 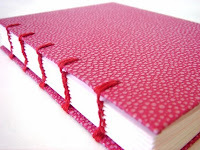 Bookbinding – 5 years. 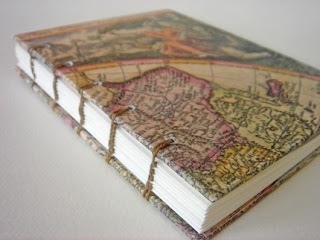 I love stitching my books exposing the spine. Maybe the Coptic stitch is my favourite at the moment. PAPER – all sorts of different paper – I just love it!! Colours inspire me the most! My bookbinding teacher Javier Abellan. Always making two identical books and keeping one for myself!! These are fabulous..just fab!!! Are those leather you offer as well?